Promoting open discourse about the politics of urban informality, we welcome contributions to this atlas by researchers, artists or activists about the architectures and socio-political workings of informal markets across the globe. If you wish to add your textual or visual material to this online collection of case studies, please contact the research team. Bringing together more than 80 case studies from around the globe, the atlas highlights current fault lines between bottom-up social organisation and top-down political power. Through cartographies, visuals and texts, it identifies emerging informal market configurations such as border markets, post-conflict markets, container markets or hipster markets that demonstrate the changing relations between space and politics in a world of global connectivity. 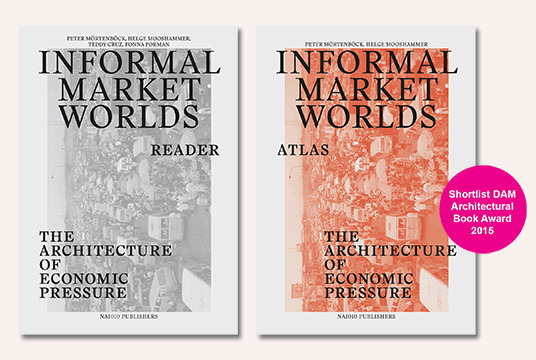 This atlas is accompanied by the Informal Market Worlds READER (nai010 publishers, Rotterdam, 2015), addressing the complexity of issues impacting on 21st century informality, while also opening up the debate about the scope of informality for instigating change. Edited by Teddy Cruz, Fonna Forman, Peter Mörtenböck and Helge Mooshammer, and with contributions by Hou Hanru, Keith Hart, Jiang Jun, Lawrence Liang, MAP Office (Laurent Gutierrez & Valerie Portefaix), Vyjayanthi Rao, Ananya Roy, Saskia Sassen, AbdouMaliq Simone, Gayatri Chakravorty Spivak, Ignacio Valero, Matias Viegener and others. Other Markets is an international research project that investigates the architectural and cultural realm of informal markets as a decisive yet often overlooked theatre of urban transformation. Debating the spatial culture of informal markets as an arena of negotiation between multiple political demands, social actors and environmental constraints, Other Markets aims to conceptualise how we can build more equal participation in the space of economy vis-à-vis the economy of space. In what ways can the spatial practices and cultural mechanisms that sustain informal markets help us to articulate urban policies that are in line with the transnational realities of today's populations? The online atlas Informal Market Worlds contains multi-level analyses derived from on-site investigations into a global range of informal markets and the ways they yield adaptations to the use of territorial, social and legal resources. Studies on the relational structures of informal markets address the intersection of graduated m o b i l i t y with urban spatial organisation. Studies on the transient ecologies of informal markets investigate local manifestations of provisional l a n d u s e produced by shifting patterns of global socio-political organisation. Studies on the legal architectures of informal markets examine the interrelationships between t r a n s n a t i o n a l i t y and new technologies of government and self-organisation. In addition to field studies carried out by the Other Markets research team, this atlas includes a growing number of studies by other researchers into informal markets across the globe, such as the study by architecture collective opaq into the Four Tigers Market in Budapest, Hungary or by Caroline Humphrey and Vera Skvirskaja into the 7 Kilometer container market in Odessa, Ukraine. Together, these studies support the development of a trans-disciplinary framework on the catalytic potential of informal markets as politics in matter, as a form of political conflictual practice that transfers values and ideas into the realm of urban action.